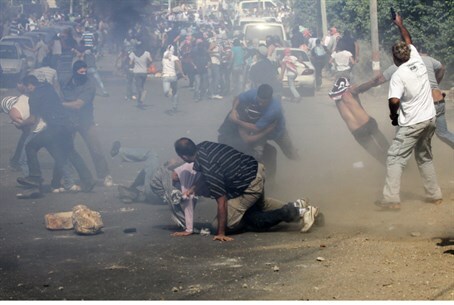 Arab mob smashes windshields of cars as frantic Jews make getaway. This is Jerusalem, 2013. A video uploaded Wednesday shows a frenzied Arab mob targeting cars driven by Jews as they pass near Jerusalem's Damascus (Shechem) Gate. The video was uploaded to the “Free Qudss” account on YouTube, and to a group by a similar name on Facebook. The text at the start of the video reads: "Destroying the settlers cars and arrests", and claims to have been taken near Damascus Gate. The account's operators and the videographers claim the events are from Tuesday evening, and that the identities of the attackers had been blurred out to protect them from being identified. Scenes of mayhem like these are becoming increasingly frequent in Jerusalem and other parts of Israel. Just this morning, Jewish residents of the Abu Tor neighbourhood woke up to find the tires of their cars slashed in an apparent attack by Arab extremists. Some parts of Jerusalem have become virtually no-go areas for Jewish residents. The Mount of Olives for example, site of an ancient Jewish cemetery, has become a danger zone, with Jews afraid to approach their ancestors' graves. This latest video comes less than a day after a Jewish man was stabbed in the same area of Jerusalem. This widespread grassroots terror against Jews has gone mostly unreported elsewhere in the media, and is often reported exclusively on Arutz Sheva.